Ngozi Nwosu posted a bedroom photo and she indicated that she was enjoying a chat with her close friend. Despite spending over 5 decades in this world, aunty Ngozi is still very much hot as she waits for the man to occupy her heart. 55-year-old Ngozi Nwosu was spotted rocking a beautiful glittering dress in the new photos. The actress looked stunning and breathtaking in the mini silver dress paired with silver heel sandals. The beautiful dress showed off the actress’ legs and the color also complemented her fair skin-tone. In the photos shared on her Instagram page, the actress also styled her hair like a bride. A video also showed the actress showing off her dance skills as she danced. 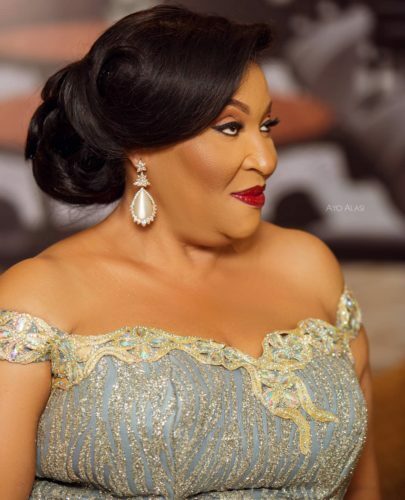 Many people may not know this due to the fact that the veteran actress and movie producer is Igbo, but she had begun her career as an actress in the Yoruba movie industry. The movie is considered to be the film that opened the cinema era in Nigeria.